Ceramic planters are a stylish choice for both indoor and outdoor design themes. They are made from clay pottery that is usually glazed, then fired in a kiln at a high temperature. Ceramic pots are available in a variety of colors and patterns, and are a stylish option for displaying tropical plants and flowers. Ceramic Containers – What Are The Advantages? Ceramic garden planters are non-porous and retain water – ideal for moisture loving tropicals as well as container water gardens. They are available in an assortment of colors and textures (matte, glossy, and textured) that compliment both indoor and outdoor design themes. Ceramic planters are not prone to salt build-up and are easy to keep clean. Some ceramic pots come with plates or saucers attached to the bottom to catch water as it flows out of the drainage hole. Ceramic plant containers are ideal for displaying a variety of tropical plants and flowers. Pottery is sensitive to extreme temperatures and susceptible to cracks and chips. Decide what the planter will hold. Choose one that will accommodate the roots of the tropical plant when it reaches maturity, re-pot plant if necessary. Select a color and/or texture that will compliment your landscape as well as the architectural style and design of your home. 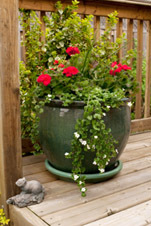 Unlike terracotta, glazed pots are non-porous. Be aware that over-watering plants will damage the roots. Handle with care. Stoneware planters are susceptible to cracks and chips.